Senator John Heinz Pittsburgh Regional History Center. As a young man in Westmoreland County, Pennsylvania, with an entrepreneurial spirit, Henry Clay Frick became the largest producer of coke from coal. Mr. Frick was a millionaire by the age of 30. This caught the eye of Andrew Carnegie, since coke is a key ingredient in the production of steel. Eventually, Mr. Carnegie brought Mr. Frick into the Carnegie Brothers and Company, to assure his steel mills a constant supply of coke. As Chairman, Frick reoganized the rapidly growing industrial concern into the world's largest coke and steel company. With the death of Andrew Carnegie's brother Thomas, the enterprise became known as the Carnegie Steel Company, Limited. Henry Clay Frick and Andrew Carnegie were both aggressive business competitors. It may have been inevitable that their partnership could not last. Major problems between the two men probably began with the 1892 labor strike at the Homestead Works of the Carnegie Steel Company. Although it was Andrew Carnegie's intention to eliminate the unions in his mills(despite earlier writings favoring collective bargaining), it was Henry Clay Frick who took the actions which set-back the labor movement for decades. Andrew Carnegie did his best to distance himself from the deaths and violence which occurred at Homestead. As the years went-on, the two men had further disputes resulting in Mr. Frick's 1899 resignation from the company. Shortly after the violence at Homestead an anarchist, Alexander Berkmann, attempted to assassinate Henry Clay Frick in Mr. Frick's second floor office in Downtown Pittsburgh. While recovering from this attack at his East End home, Clayton, Mr. Frick's fourth child, Henry Clay Frick, Jr., died shortly after birth. Public opinion had turned against Henry Clay Frick immediately after the Homestead violence. However, he gained public sympathy after the assassination attempt and the death of his infant son. 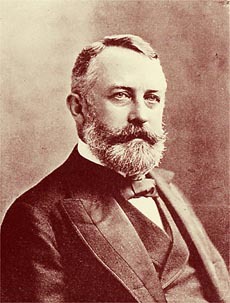 Henry Clay Frick continued his business interests in Pittsburgh, New York, and other cities, after leaving the Carnegie Steel Company. In 1900, he formed the St. Clair Steel Company, with the largest coke works in the world in the Pittsburgh suburb of Clairton. He played a major role in the formation of the United States Steel Corporation, after Andrew Carnegie sold his interests in the Carnegie Steel Company in 1901. He also made several major real estate investments in Downtown Pittsburgh including the 21-floor Frick Building, 23-floor William Penn Hotel, 14-floor Union Arcade(now known as the Union Trust Building/Two Mellon Center), and the 19-floor Frick Annex(now known as the Allegheny Building). Earlier, he had been closely involved in the construction of two other major buildings in Downtown Pittsburgh: the Carnegie Building, the first steel-frame "skyscraper," and the original Union Trust Company Building in Pittsburgh's Fourth Avenue Financial District. Click here to learn more about the buildings erected by Henry Clay Frick; click here to learn about the two office buildings Mr. Frick was closely associated with. Henry Clay Frick, who had shown an interest in art dating back to his youth, started to collect art works shortly after he made his first million dollars. By the beginning of the Twentieth Century, he held a very significant art collection. He had strongly considered building a public museum, to house his works of art, in Pittsburgh's Frick Park. In fact, it is said that Beechwood Boulevard was designed to provide a grand entrance to this new art museum. However, he finally decided to move his large collection of art works to New York City with the family in 1905, ironically, to avoid the soot of Pittsburgh's industries! Click here to see how this soot affected the exterior walls of Pittsburgh's Carnegie Institute building. This art collection forms the core of The Frick Collection. The Frick Collection is housed in the former New York City mansion, located at Seventieth Street and Fifth Avenue, Mr. Frick constructed between 1913 and 1914. Upon his death in December of 1919, Mr. Frick bequeathed this residence and the works of art for the formation of a public gallery for the purpose of “encouraging and developing the study of the fine arts...subject to occupancy by Mrs. Frick during her lifetime.” Henry Clay Frick's wife, Mrs. Adelaide Childs Frick, died in 1931; The Frick Collection opened to the public in December of 1935. 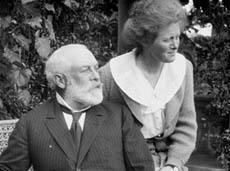 Although the Frick family moved to New York City in 1905, Mr. Frick continued his business interests and philanthropy in Pittsburgh. In 1905, $65,000 was still needed to finish the new Allegheny Observatory building; this new building, to be located two miles north of the original Allegheny Observatory, was needed for the astronomical research to escape the air pollution of the inner city. Mr. Frick promised Astronomer John A. Brashear to pay for half of that amount, if Mr. Brashear could secure the other half by Ocober. Mr. Brashear did raise the rest of the funds(and, a wee bit more), much of it by long-distance correspondence while Mr. and Mrs. Brashear were in their Summer retreat in Canada. In 1909, Henry Clay Frick asked John Brashear to organize a Commission to fund supplemental educational opportunities for public school teachers; originally, Mr. Frick's donation($250,000) to this Commission was anonymous. However, when the Commission became permanent in 1916, it became known as the Henry Clay Frick Educational Commission. In addition to the many grants to individual teachers, for special training, this Commission constructed the Henry Clay Frick Training School for Teachers(engraved above the main entrance: "THE TEACHER AND THE CHILD"), located just four blocks from the present site of the Frick Fine Arts Building. The School District of Pittsburgh now uses this building as the Frick International Studies Academy, a whole school district magnet program concentrating on an international studies curriculum for middle school students. In the 1990s, the Henry Clay Frick Educational Commission became the Henry Clay Frick Educational Fund, one of the specially-endowed funds of Pittsburgh's Buhl Foundation(better known for construction and operation of The Buhl Planetarium and Institute of Popular Science). Helen Clay Frick, from a home movie made circa 1918. To further advance the goals Mr. Frick envisioned for The Frick Collection, his daughter, Helen Clay Frick, founded the Frick Art Reference Library in 1920. Originally located in the bowling alley of the New York mansion, the Frick Art Reference Library is now located in a separate building, adjacent to The Frick Collection. Helen Clay Frick was very interested in photo-documenting works of art in America and Europe. As early as 1922, she commissioned photographers to take photographs of the works of art of many museums, for the Frick Art Reference Library. The American Commission for the Protection and Salvage of Artistic and Historic Documents in War Areas, based at the Frick Art Reference Library during World War II, used the Library's photographs and indices to ensure Allied bombers could avoid striking sites with important works of art. After the War, the Library's records were used to aid in the repatriation of art. Following Helen Clay Frick's death in 1984, she bequeathed her beloved family home in Pittsburgh, Clayton, to become a house museum that shows how people lived during "The Gilded Age." She had already created The Frick Art Museum on the Clayton estate, in 1969, to house her own fine art collection. Additionally, the original Carriage House has become a Car and Carriage Museum, which shows antique automobiles of the Frick family and others prominent Pittsburgh families. The original Children's Playhouse is now a Visitors' Center and the family Greenhouse, which is still used for providing fresh flowers for Clayton, is also open to the public. Collectively, these facilities are now known as the Frick Art and Historical Center. Although there is a fee to tour Clayton, all other buildings can be viewed by the public free-of-charge. Henry Clay Frick was, for many years, a partner of Andrew Carnegie in the Carnegie Steel Company. * Note: Facilities preceeded by an asterisk are free-of-charge to the public! Unless otherwise indicated, all pages in this web site are Copyright 2001, Glenn A. Walsh, All Rights Reserved. This Internet web page was originally created 2001 July 12. Last modified : Sunday, 15-Apr-2012 22:10:41 EDT. You are visitor number , to this web page, since 2001 July 12.